Look at all these little gifts for under £5! £5 or under in Handmade Happiness. See details below. You know what day it is! This scary monster taking up a whole window gave me a fright! I was in the Blackmoor craft barn on what surely was the rainiest day of the year so far, looking at some stuffed toys someone had made for just 85p each to sell for her favourite charity. 'Now that is what I call a reasonable price,' the woman beside me piped up. 'It's near the vet's' she carried on recklessly. 'Oh... You must mean my shop.' I said. She clapped her hand over her mouth and I slipped away. But I got thinking and, apart from the fact that I'm sure that person has never been inside Handmade Happiness, I realised that many people must see it as an expensive shop. So I thought I'd collect together things for under £5 for little gifts or stocking fillers and maybe someone reading this will change their mind about HH being expensive and venture inside! 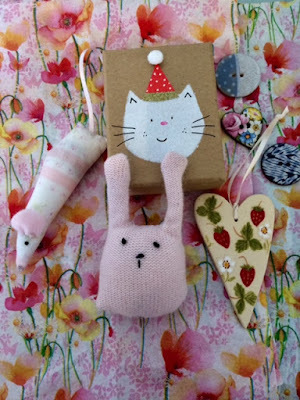 Pictured above are: lavender filled mouse £5 and cashmere bunny £4-50 by me; gift box with velvet lining decorated by Sue Inglis, £4-50; ceramic heart made and decorated by Kate Hackett £4-50 and assorted handmade ceramic buttons for £1-50 each. So come on in. You'll get a warm welcome! 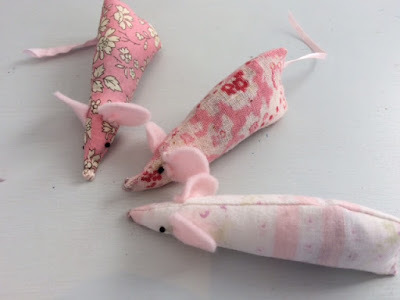 I've made 35 Liberty mice stuffed with lavender. £5 each. 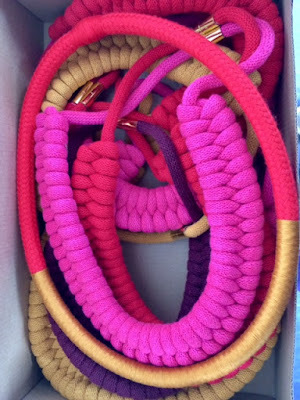 Check out these Beth Pegler necklaces. I bought one in London recently and wore it non-stop so I knew I wanted them for the shop. Beth handmakes every one and uses strong magnet clasps. I have two sizes and a choice of mustard, red, shocking pink and burgundy. £25 each. A great gift and I expect a lot of women will buy them for themselves. Kate Hackett's ceramic robins always sell out several times over in the run up to Christmas. Right now the shop has a large stock of them. £3 each. It's that busy time of year again with not enough hours in the day to make all I want to make for Christmas. This year I've decided to use all my carefully saved hoard of fabrics and trimmings and to stop hanging on to my favourite bits. After all anything I leave in the loft will only go to a charity shop or, worse, straight into a skip, when I'm gone. My three children aren't interested in making things, although each is creative in his or her own way. So I've used some of my precious collection of Liberty bits to make these mice and selling them for a reasonable price will help the shop. My kind neighbour always dries the lavender from her two bushes and gives it to me and it's this 2018 lavender I've used to stuff the mice with. It smells wonderful! Next stockings - but I've got to dye a blanket first - I used to sell lots of my big, embroidered stockings... and I have a new idea for Christmas cards this year ...and I've promised a customer to make more tiny fairies this week. And what about the boys? I never seem to have enough in the shop for boys and men. Anyone out there making presents that a man would love? Step this way, I'd be very interested in chatting with you! Enjoy your day and your weekend everyone and happy making if you are a maker like me! 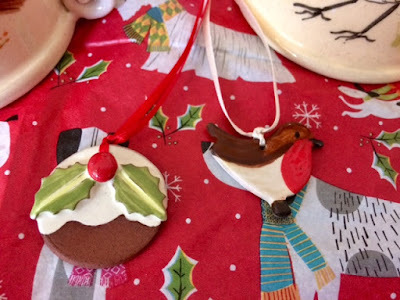 This week Handmade Happiness has got Christmas decorations. I know other shops have had Christmas cards and Christmas decorations for weeks now but I feel this is the right time when people won't have a fit when they see them. We can start the Christmas countdown and it makes sense to spread the inevitable cost by starting to shop now. Sue Inglis must knit night and day to produce as many cute creatures as she does! I also stock her cards and gift boxes. 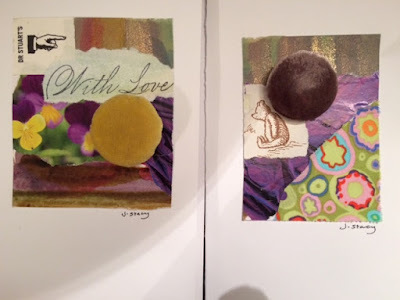 All made with her sensitive eye for colour and design. And each year she introduces us to fresh, new items. I've also just had a delivery of lots of wrist warmers and neck warmers from the talented Kate Box. Last Christmas Kate's work kept selling out so I advise customers to buy early while I have a really good selection of designs and colours to choose from. 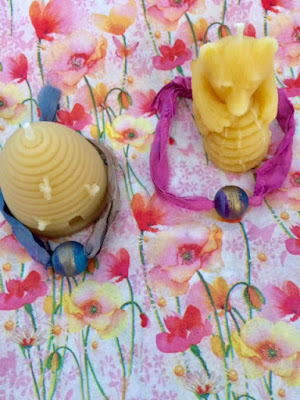 Each item is individually hand made (like everything in the shop) and it takes time to re-stock. Yesterday I was visited by the Good Fairy! It had been a quiet day in the shop (some days are like that) and this lovely lady, who does so much to help charitable organisations on a voluntary basis, started doing her Christmas shopping and completely turned the day around for me. So thank you Good Fairy, you know who you are and I am grateful to you! Apologies for not writing down who made these stitched wall hangings. What a week it's been! At lunchtime on Thursday I caught the train to Alexandra Palace to spent a blissful couple of hours wandering the halls of all things textile. If you haven't been to this annual show make a point of going next year. 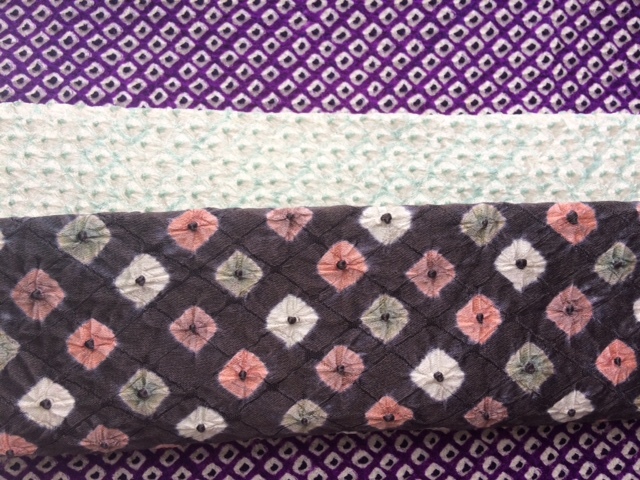 For anyone interested in knitting or sewing or textile art it is a total joy! This year I was intrigued by the Japanese stall pictured above. The silk squares I bought which are richly textured I am already using in my medals for women. 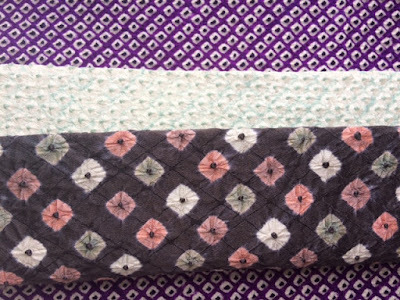 Traditionally this material was used in the sash belts on kimonos and it, along with the Japanese gifts on this stall, make you think of nimble fingers and Japanese grace and delicacy. And the ladies gave out a free origami crane with every purchase. I fell for the colours of this sari silk ribbon and hopefully it will look lovely in some textile jewellery I plan to use it for. Yesterday, Sunday, I took a stall at Blackmoor Apple Day. Well it rained didn't it? It deluged down for most of the day. I had worked hard to produce a stall packed with my own makes. People kept telling me how crowded it usually was and how well they had done in previous years but no-one could control the weather and most sensible people stayed at home! At least now I have lots more stock for Handmade Happiness! And from Wednesday onwards Handmade Happiness gets into Christmas mode with new decorations from Sue Inglis and new decorations from me. Hope to see you there during the Christmas run up and if you do visit the shop please say hello. The Stats button tells me that lots of people regularly read this blog but it would be great to know who you are!! I stopped making cards because they take so long to make individually. It makes much more economic sense to use my time to make jewellery. However I had a pile of velvet buttons and no good way of displaying them and so the 'One Button' card was born. 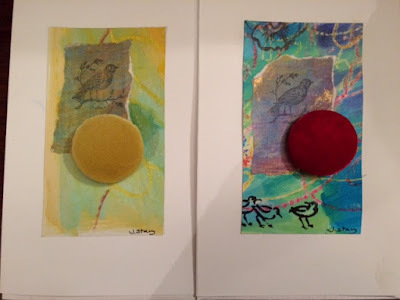 I will have 12 greetings cards, all individually made, to sell in the shop this week each with its own tactile silk velvet button. Sue Inglis makes good cards for Handmade Happiness. 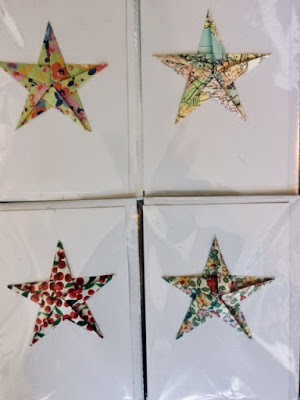 These star cards at just £1.95 are especially popular and I'd completely sold out before she bought in lots more on Friday. With no message they are suitable for any occasion. I thought I'd have a go at making one of those stars, following a You Tube video. I couldn't master the final bit and eventually gave up. I'll leave making origami stars to the expert! 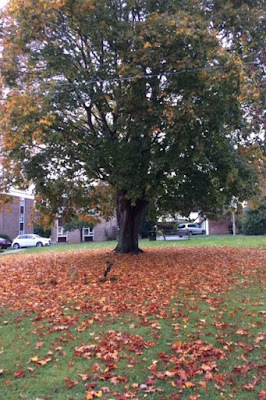 This week the temperature has dived and there's a nip in the air. Fallen leaves blow into the shop through the open doors and sweeping them out again takes me from my making table. But I'm making a lot at the moment, spurred on by the fact I'm doing a fair this Sunday and just selling my own designs. Blackmoor Apple Day this Sunday October 14th. Entrance is free.